To ensure compatibility between safety products from different manufacturers, compatibility of all stacks on the market is essential. 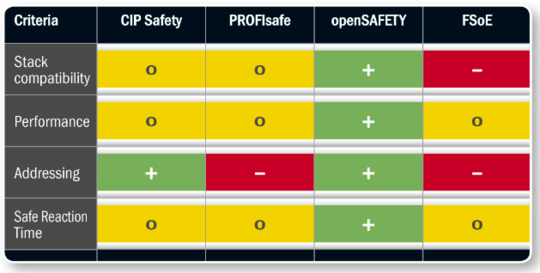 Open source strategy of openSAFETY guarantees stack compatibility. In a safety network, all nodes must have unique IDs. To avoid parameter setting errors, addressing should be automated. The PROFIsafe and FSoE protocols, however, require manual address setting for each safety device using DIP switches. This makes installation of safety devices in the control cabinet more complicated. Human error, particularly in maintenance scenarios, could result in faulty parameter setting. It is also very difficult to create modular machine concepts using hardware switches, as this form of addressing is always rigid and components cannot be configured automatically. Following the producer consumer principle, openSAFETY supports direct cross communication, which results in singularly fast reactions. Routing all safety messages via the master, as in PROFIsafe and FSoE, extends cycle times. Consequently, valuable time for safe reactions is lost. CIP Safety requires originator functions to support cross-traffic, thus a cross- traffic between slaves (targets) is not possible.